For an active, independent lifestyle, Royal Gardens is an innovative approach to retirement living. 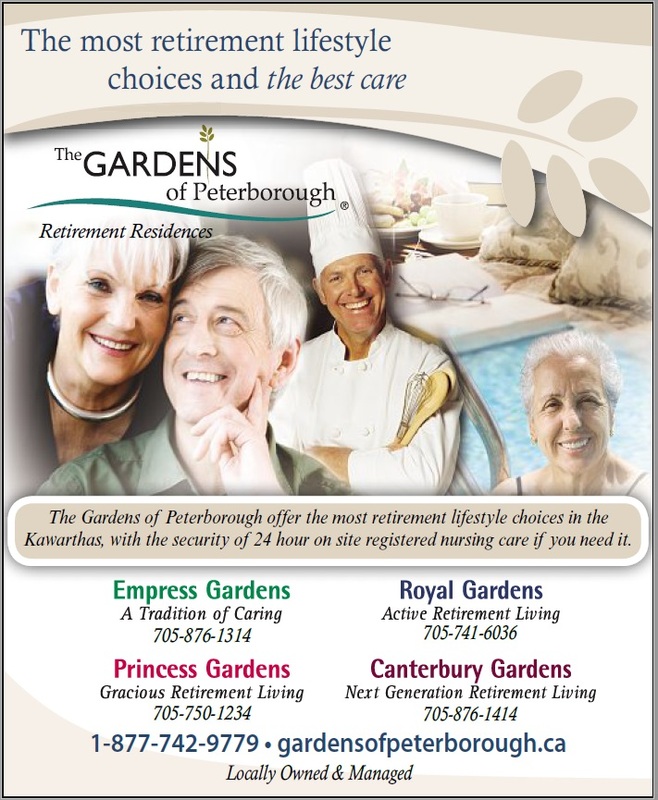 Located in the west end of Peterborough, Royal Gardens is set on beautifully landscaped grounds in an established neighborhood of mature trees and upscale homes. When older adults move here, they exchange the chores of home and property maintenance for a carefree life in an upscale, resort-Royal Gardens prides itself in offering high quality accommodations and excellent services. We offer a full range of Lifestyle Options, including 24 hour on-site registered nursing and personal assistance if you need it. Short-term Respite and Convalescence visits are also available. 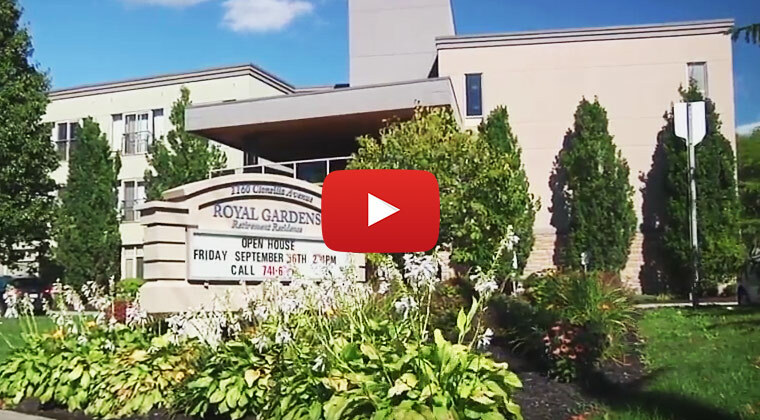 Royal Gardens was designed with today's independent older adult in mind. Residents enjoy a variety of social events, including frequent planned outings, in-house movies, family gatherings, and friendly games of bridge. Unique to Royal Gardens, residents can also exercise in our state-of-the-art fitness center staffed by a qualified Fitness and Wellness Coordinator. The beautiful Royal Atrium is the focal point for life at Royal Gardens. This bright and spacious indoor park includes a recreational games area and tearoom. You are sure to find the Royal Atrium one of your favorite places to be. The perfect place for social events, games, and gatherings of any sort, the sunlit three-story Atrium is host to regular Special Events such as concerts, health-fairs and art and craft shows. Enjoy billiards, shuffleboard, or practice your swing with our indoor golf net. Trees, terraced gardens and a fountain make the Atrium a garden park within your own home. If the real outdoors call you, just step outside onto the patio to enjoy refreshments or a barbeque. Dinner is a special time at Royal Gardens. Dine in the tradition of a fine hotel, but with the flavour and personal touches of home. Our qualified chefs and well-trained staff are always ready to serve you with a smile. Enjoy our broad menu prepared with the freshest ingredients in our own kitchen. Invite your family to join you in the dining room or entertain privately. Please visit our Dining section to find out more about the dining experience at Royal Gardens. Royal Gardens' tastefully decorated interior boasts many comfortable and unique lounges and common areas, one of which is sure to suit your individual tastes. The Fireside Lounge is a great place to meet your family, friends, and neighbours before a meal or to have a quiet cup of tea. Curl up with a good book beside the cozy fire, watch the big screen television, or enjoy some fresh air on either the lovely, sun-filled patio deck or in the garden gazebo. There are plenty of comfortable places to relax and visit with family and friends at Royal Gardens. Treat yourself at the on-site Beauty Salon and enjoy a manicure—or spend some personal time reflecting in the peace of our library or our non-denominational chapel. The Games Deck is perfect for board games or bridge. Enjoy a film in our comfortable movie theatre. Take part in the many activities and Special Events arranged by our full-time Activity Director, or relax and enjoy your own individual interests. At Royal Gardens, you decide how to spend your day. Located on Clonsilla Avenue, close to the hospital, churches, and not too far from either downtown or Highway 115, Royal Gardens has everything you need to live how you want to live. Covered parking is available. Explore our Programs & Services section to find out about housekeeping, laundry, and the many other services for your comfort. Visit our Amenities section to find out more about our facilities and security features, including emergency response systems, monitored entrances, emergency power generator and fire safety features. Royal Gardens offers a variety of spacious floor plans, including studio, one and two-bedroom suites. You can even invite your family to stay in our guest suite. With a strong reputation and an unsurpassed commitment to Care, Royal Gardens offers a full range of Care options so that friends, routines, tastes, and care-providers don't need to change if circumstances do. 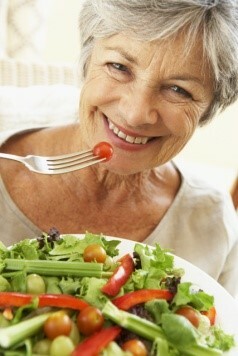 Our philosophy is "healthy aging in place". This means that you can live your life to its fullest, experiencing new things or comfortable, familiar things—all with the safety and security of our 24 hour on-site registered nursing staff right at hand should you need them. At Royal Gardens you will find the added independence of our exclusive Garden Homes. Available in spacious one-bedroom or two bedroom floor plans, Garden Homes offer the perfect balance of independence and privacy with the security, activities, and social interaction of the entire Royal Gardens community. Thank you for your interest in Royal Gardens. We look forward to showing you around our lovely community to give you an inside glimpse of the lifestyle that awaits you here. Please Contact Us if you would like further information. Click the image below to watch a virtual tour of Royal Gardens.